It’s been a couple of weeks since I decided to play around with my beater bike and try cyclocross. Here’s the scoop. When my knobby 32 mm tires came, I glued them onto the wheels I built last summer. Aren’t those gorgeous? 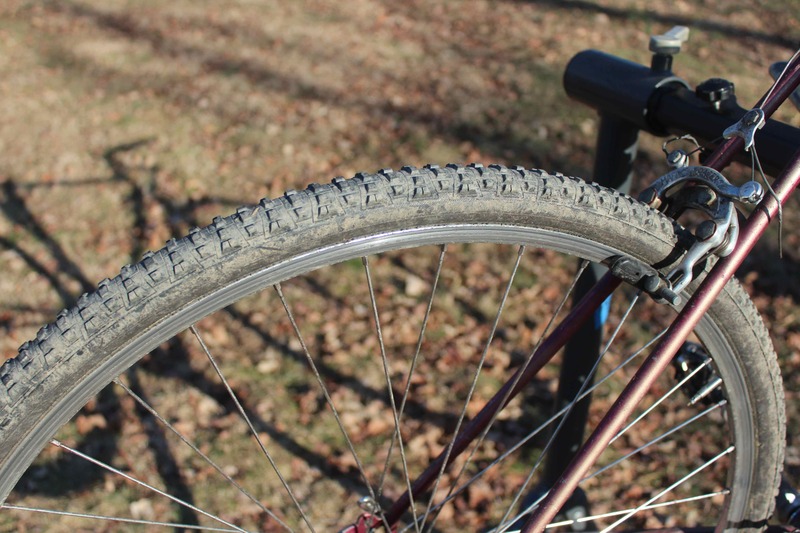 Plus, for traction, cyclocross tires use much lower pressures than road tires. Low pressure = comfort. These have 40 psi in them, and that feels perfect for all kinds of terrain. I removed the water bottle cages. The cages would get in the way when you have to put your arm through the frame to carry the bike on steep or unrideably-muddy stretches. Since the longest cyclocross competition lasts about an hour, there is no need for hydration en route. I switched to a shorter stem and raised the bars a bit from where they were before. Because the speeds are so slow compared to road rides, there is no need to maintain a streamlined aerodynamic position. Also, the shorter reach helps to maintain control over rough sections. 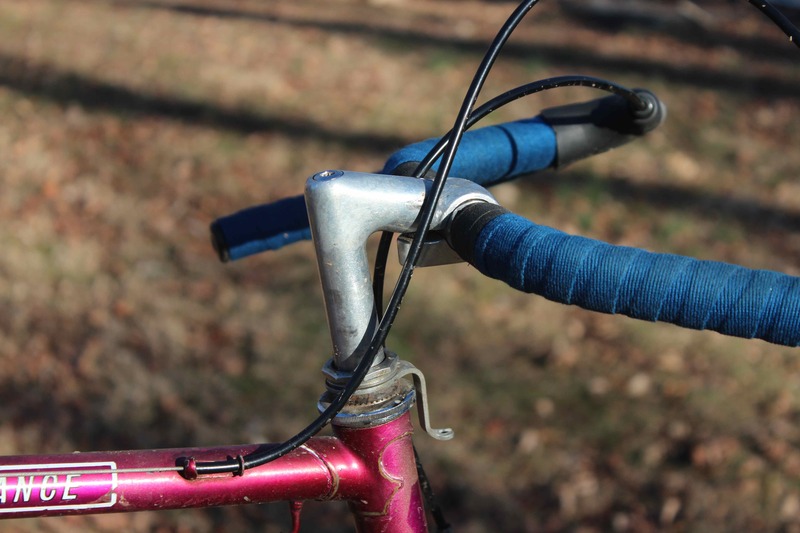 Because I had to remove the old handlebar tape to change stems, I replaced it with cotton twill cloth tape. Where has this been all my life? Granted, after a half dozen rides it is starting to look dirty, but this is not about style. This tape gives me incredible grip without feeling tacky or spongy like others do. I like the feeling of firmness and control. I took this one from an old mountain bike. 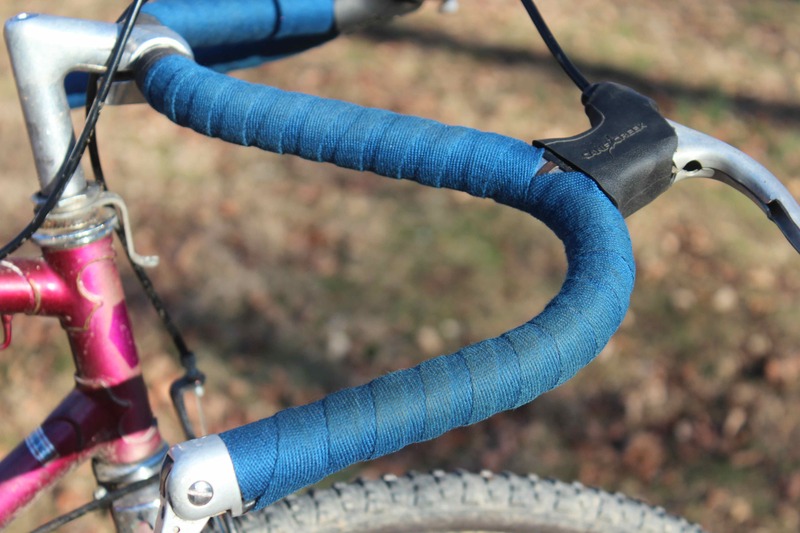 It’s not leather, but in cyclocross the tires constantly throw mud and water up onto and under the saddle. The synthetic composition of this one will withstand the elements much better. 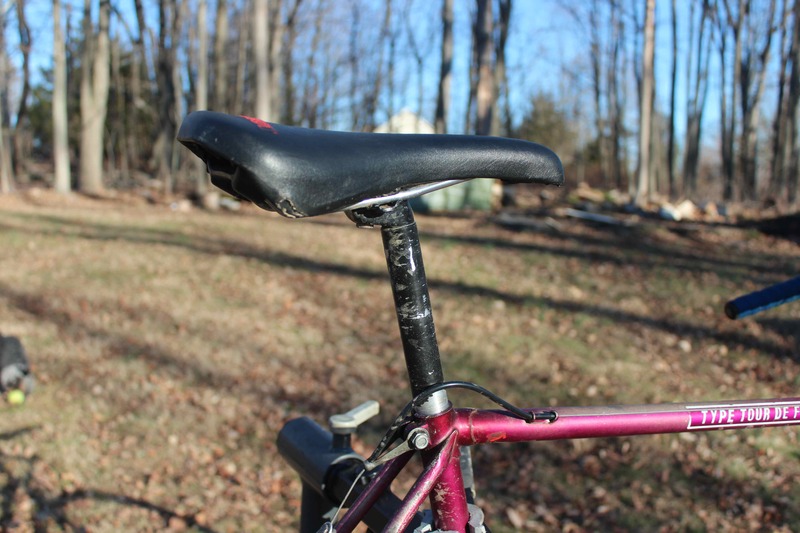 Also, this saddle has a narrower profile than the ones I use for road cycling. 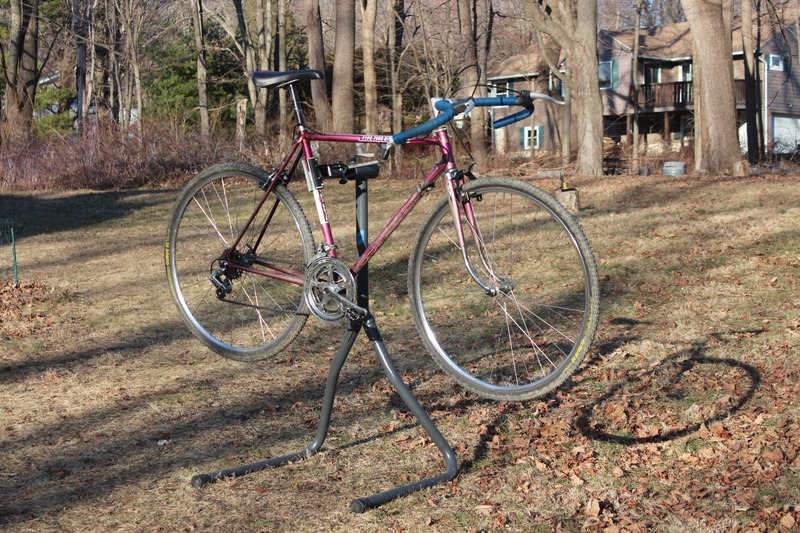 This makes things easier when I need to dismount to run or remount after running. I swapped for the double-sided pedals that had been on my mountain bike. Because cyclocross necessitates transition from riding to running and back so often, I thought it was much more important to have these on this bike than on my mountain bike. I left my gearing alone. 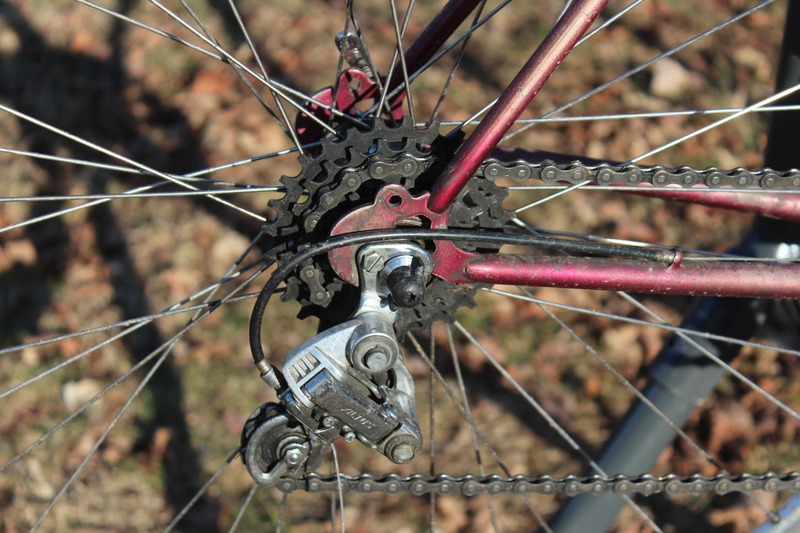 Combined with a 39-tooth small chainring, this 14-28 five-speed freewheel gives me all the range I need. I kept the moustache bars. These are much wider than those I would use on a road racing bike. but the wide stance gives me lots of control and stability on downhill and technical sections. 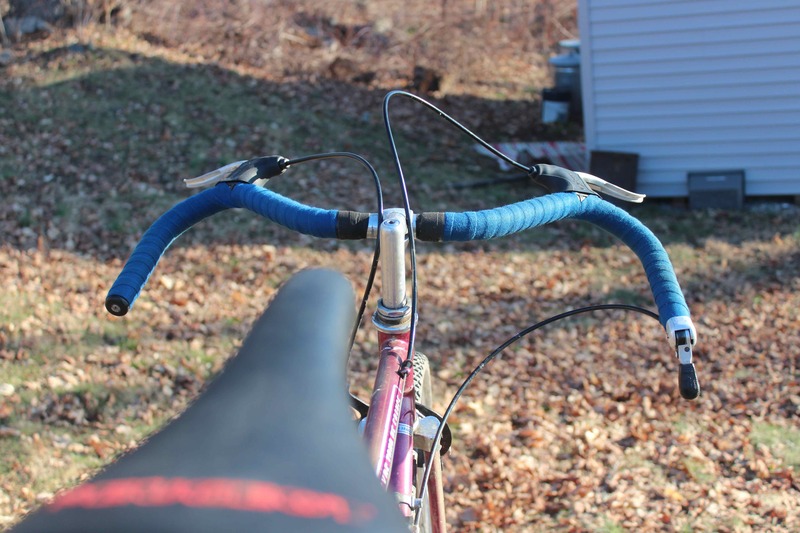 Also, these bars put your hands in a great position for climbing, much better than drop bars. I’m so proud of her. 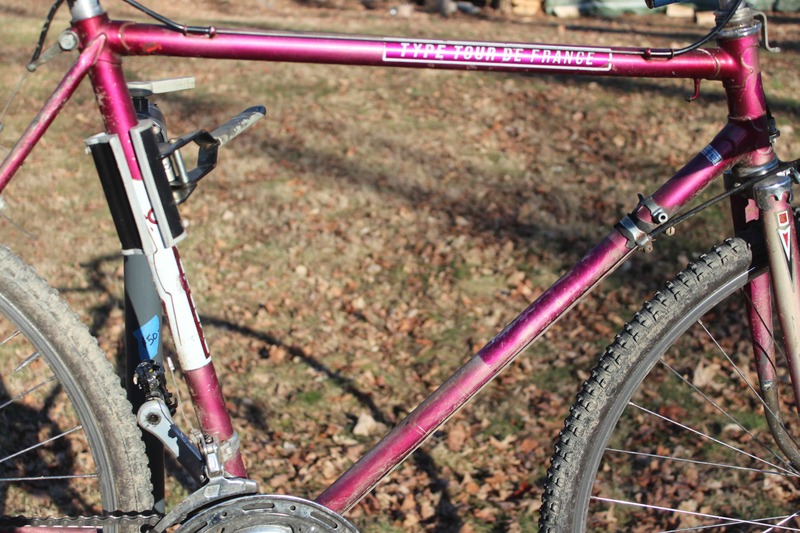 So now that I have a dozen rides under my belt, what are my thoughts on cyclocross so far? I stay warm. For one thing, he speeds are much slower than those of road rides. There is no easy riding on a cyclocross trail. You’re either riding through grass, thick mud, or snow, and when you can’t ride any more you pick up the bike and run. Also, the trails are generally narrow openings in woods, protected from most of the wind. In all the years I’ve been cycling, I have never found a way to keep my hands and feet warm while riding on the road in cold weather. You name a glove or boot or overshoe that is guaranteed to keep you warm, and I’ve tried it, unsuccessfully. On the other hand, this past weekend I finished a ride having worked up a lather sweating, while wearing normal wool socks and thin running gloves. When I checked the temperature, I was shocked to discover it was 34 Fahrenheit. I never could have lasted if I had been on an open road at 17 or 18 mph. The rides are shorter. Bicycles are such efficient machines that it normally takes three or four hours to get a worthwhile workout. That’s fine in the summer, but winter evening comes much earlier, and I like to pack in as much activity as I can in a day. Because you work so much harder just to maintain your forward momentum in cyclocross, you can get a decent workout in an hour. For me, that means being able to go home, clean the bike, shower, read for a while, and still go out with my wife for sushi before it gets too late. There aren’t the usual road hazards. Whether it’s traffic, glass and other detritus, or red lights and stop signs, there are lots of things that can break up road rides. I’d much rather avoid a tree root that nature put in my way, or stop for a family of ducks to cross my path, than deal with anything man-made. People walking unleashed dogs. In the state where I live, dogs must be on leashes when they are in public. But no matter where I go, there seems to be someone who can’t be bothered to leash his pet. So here I am, trying to maintain control of a skinny, light bike on a technical trail, and along comes Fluffy, running into my path and jumping up on me when I stop so I don’t hit him. Invariably, the owner lollygags around the bend and says, “It’s all right. He’s friendly.” Well, you might be friendly too, but if you jumped on me, that would be assault, pal. I love dogs, but you don’t know that. It takes a really selfish, entitled person to assume someone else doesn’t mind being jumped on by a dog. That’s it. My dislikes constitute a really short list. Notice, also, that the dislike list has nothing to do with cyclocross itself. Unleashed dogs can ruin any activity I want to keep to myself. There really is no satisfactory way to avoid the presence of others. 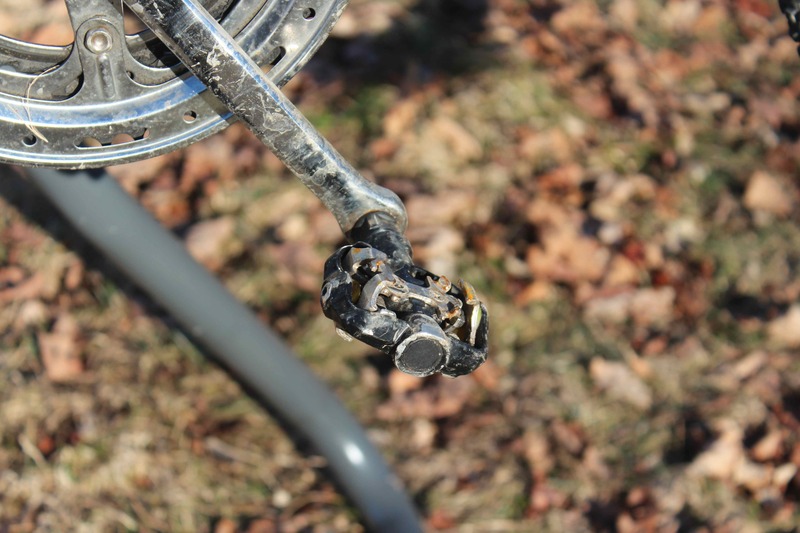 Posted on February 22, 2016 by The Fearless Curmudgeon	This entry was tagged bicycling, comfort, cycling, cyclocross, dogs, entitlement, handlebar, laws, leash, maintenance, moustache, road, selfishness, tire, tubular, unleashed, winter. Bookmark the permalink.